Kerala economy is dominated by the service industry. Its per capita GDP is more than several other states in the country. Human Development Index of the state is the best in India. The economy of the state is described by many as a "Democratic Socialist Welfare State". But, what the state lacks is that it has only a few manufacturing units. About 30 lakh people from the state are working in Persian Gulf. In the way, the economy of the Kerala is mainly dependant on the transfer of money by these foreign workers to Kerala. The IT industry is gradually developing in the state. Kerala is the source for the minerals like lImenite, Kaolin, Limestone, etc. 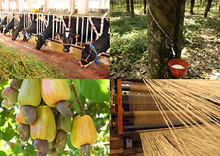 The industries like coir and cashew can be described as the major industries in the state. However, handloom and bamboo based industries are also well developed in the state. Almost one third of the marine exports of the country are from Kerala. Kerala is preferring the commercial agriculture to food crops. 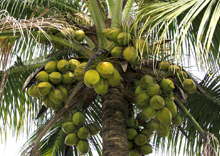 The state accounts for 70% of coconut and 91% of India's rubber. About half of the people of the state are engaged in agriculture.